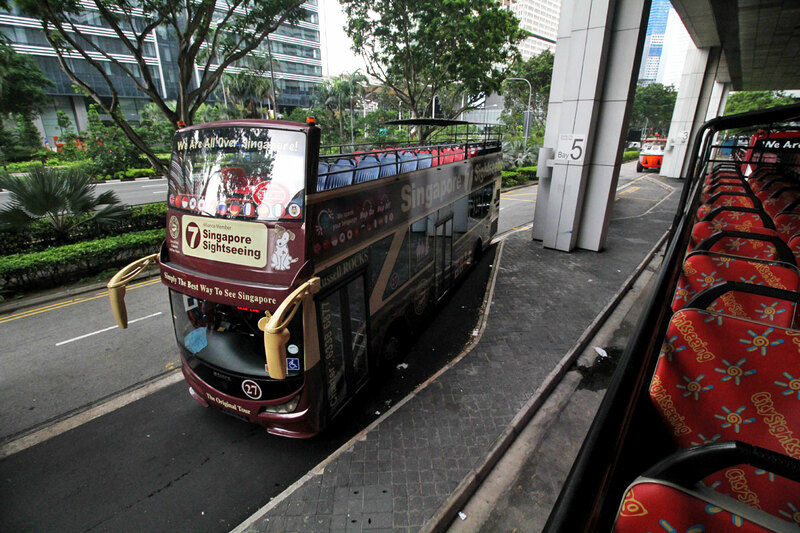 The first time we got on one of these Hop On Hop Off buses was in Sydney, Australia. It was a revelation. We used to rely solely on public transportation to visit points of interest so I never knew how easy and convenient these double-decker buses could be. We got to see most (if not all) of Sydney’s key attractions in one day, and best of all, we got to see them at our own pace. 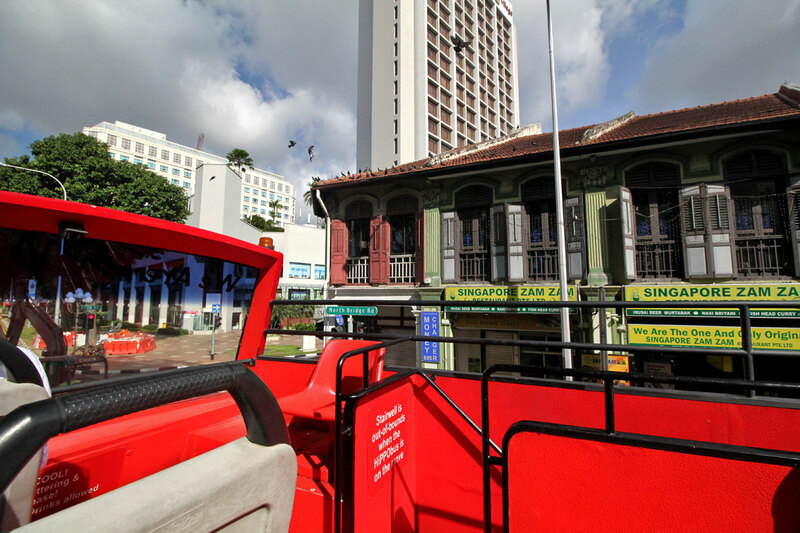 If you’ve never taken one of these Hop On Hop Off tours before, they’re typically double-decker buses that ply a set route through a city’s major attractions. They have stops at these key points where you can hop on and off. 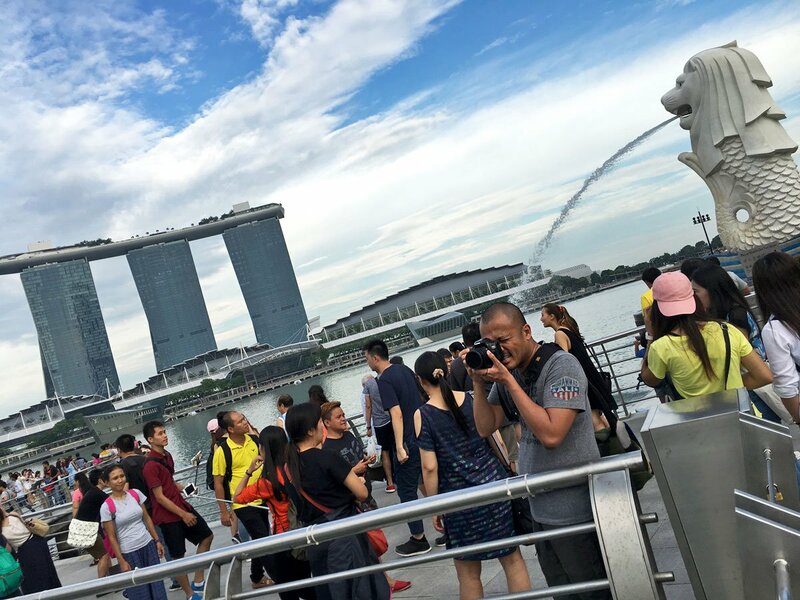 Wanna get off and take some selfies with the Merlion? No problem! Take as many selfies as you want. And when you’re done, just wait at the same stop and the next bus shouldn’t be too far away. 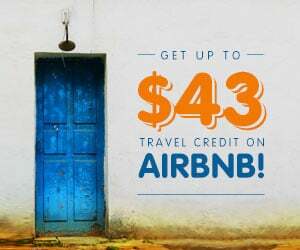 You’ll have the freedom to hop on and off as many times as you like within the validity period of your pass, which is typically 24, 48, or 72 hours from the moment you first hopped on. Pretty cool right? Apart from a map, you’ll also be given headphones so you can plug into the onboard audio guide. Hop on Hop Off buses are so convenient that it’s the first thing I search for now when visiting a new city. Unless there’s a known traffic or pollution problem, then there’s no better way to become acquainted with a new destination. Such was the case in Singapore. Our hotel was in Little India so we waited for the big red bus in front of the Tekka Centre Food Hall. 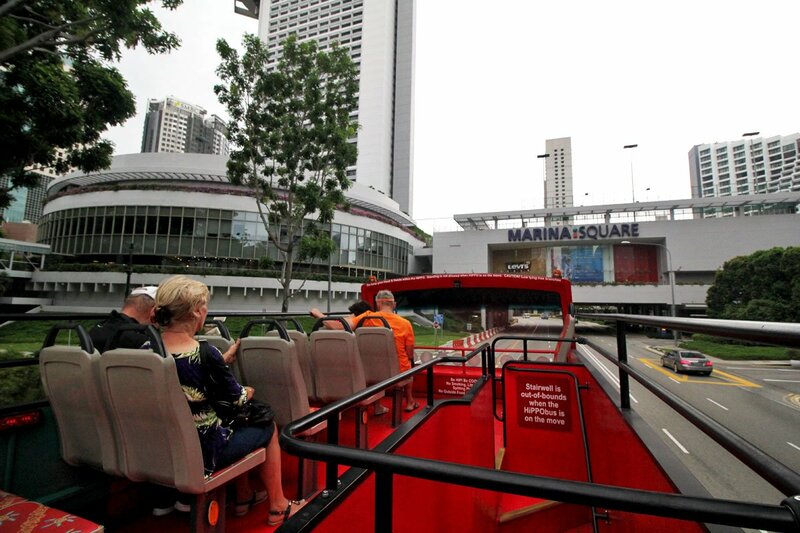 Several companies offer Hop On Hop Off tours in Singapore but we went with DUCK & HiPPO Tours. Pictures here are just a few of its key stops. They have 7 lines in all with different routes so you can experience as much of the city as possible. Scroll down to the bottom of this post for prices, bus routes, a timetable, and discount information. And away we go! I prefer sitting up top but Singapore gets pretty hot so you can sit on the first level if you want air-conditioning. 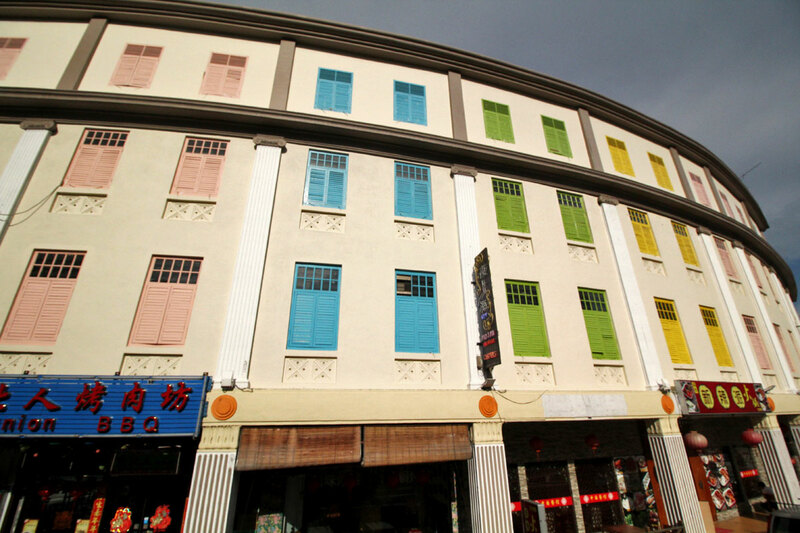 Check out the Old Hill Street Police Station with its colorful windows. 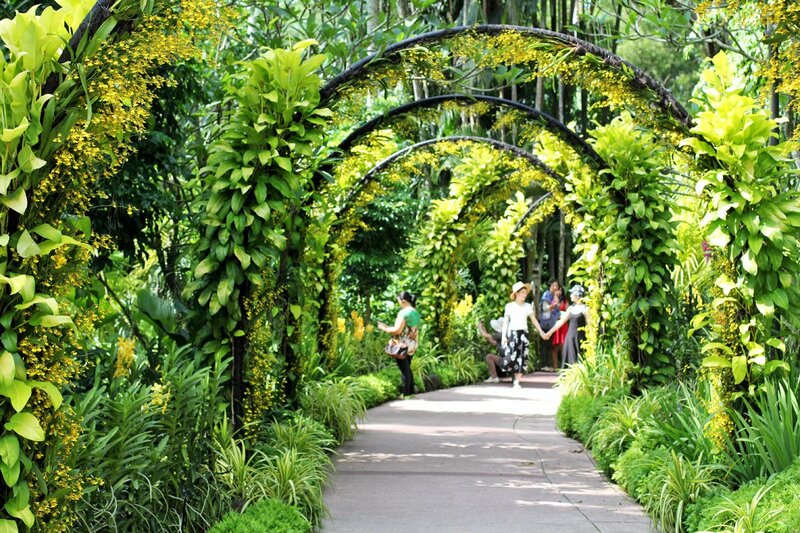 One of the stops on the Yellow line (arguably the best of the 7) is the Singapore Botanic Gardens. A UNESCO World Heritage Site, it covers an area of 74 hectares and is home to themed gardens and lakes, even a tropical rain forest! It’s also home to the National Orchid Garden which houses the largest display of orchids in the world. It’s a beautiful place so I suggest hopping off here. You can check out my post on the National Orchid Garden for more pictures and information. Where Singapore goes to shop. A prime stretch of real estate, I like to think of it as as the Rodeo Drive of Singapore. 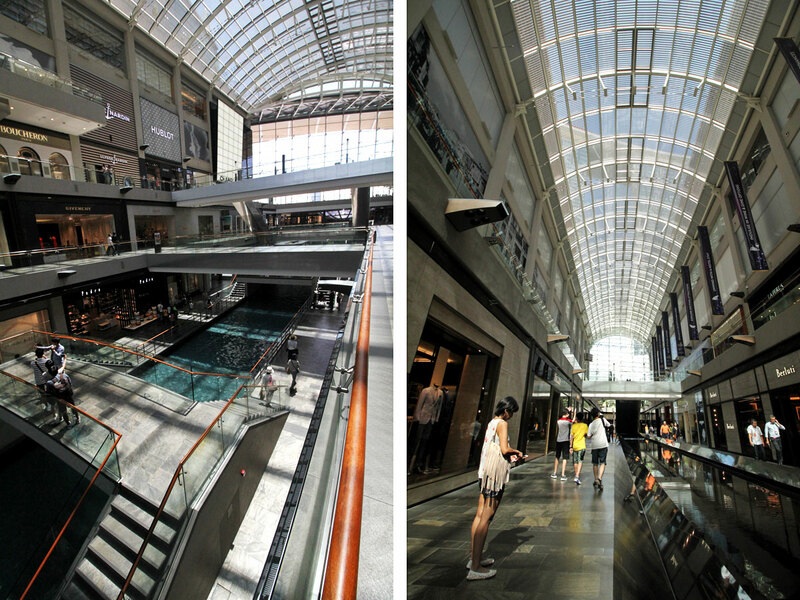 You’ll find plenty of high-end malls, boutiques, cafes, and restaurants here. This is the area where we stayed. 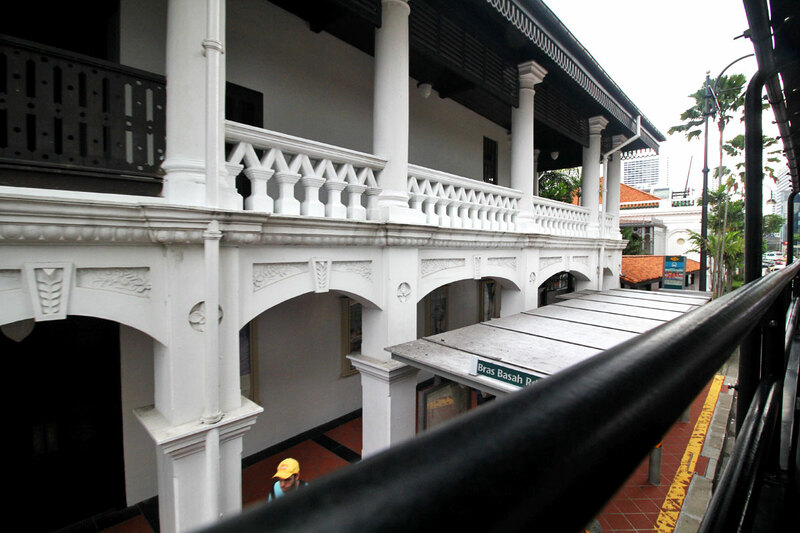 DUCK & HiPPO offers free walking tours of Little India every Tuesday, Thursday, and Saturday from 10:30AM-1PM. You can grab a flyer from any of the buses for more information. The restaurant pictured below — Singapore Zam Zam — is one of the city’s most legendary eateries. They’ve been around since 1908 and are known for serving some of the best murtabak in Singapore. Coming up on the left is the iconic Raffles Hotel, named after the founder of Singapore Sir Thomas Stamford Raffles. 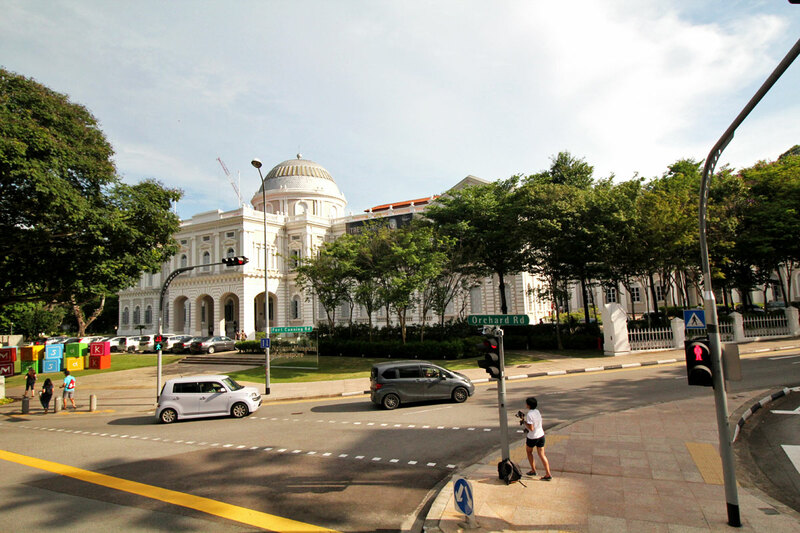 It’s one of Singapore’s finest hotels with standard rooms going for around SGD 700+ a night. 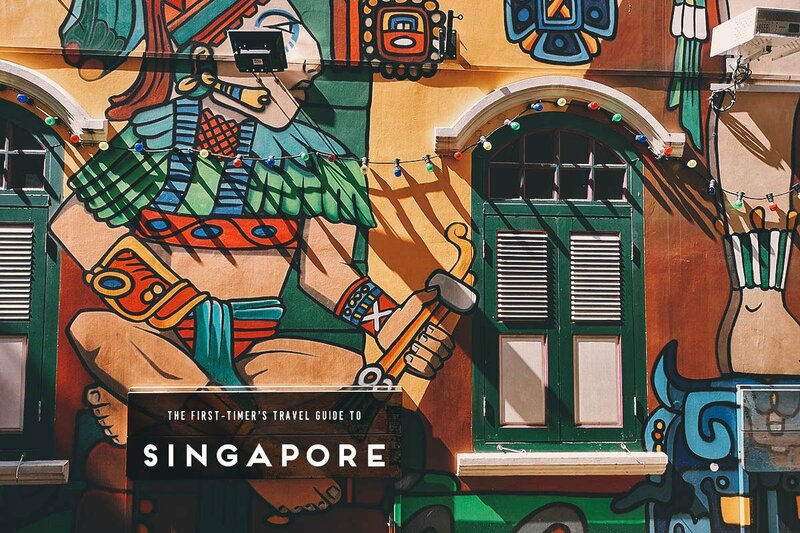 😯 It’s also home to Long Bar, where Singapore’s national cocktail — the Singapore Sling — was invented. Duck & HiPPO’s main terminal is at Suntec City Mall. Once the bus reaches the terminal, everyone will be asked to get off. You can then hop on any of the other lines including the next bus for the line you were just on. The bus below is from the Brown line. We got on midway through the Yellow line so we hopped on it again to do the full loop. As previously mentioned, the Yellow line is the best because it takes you to most of the city’s key attractions. 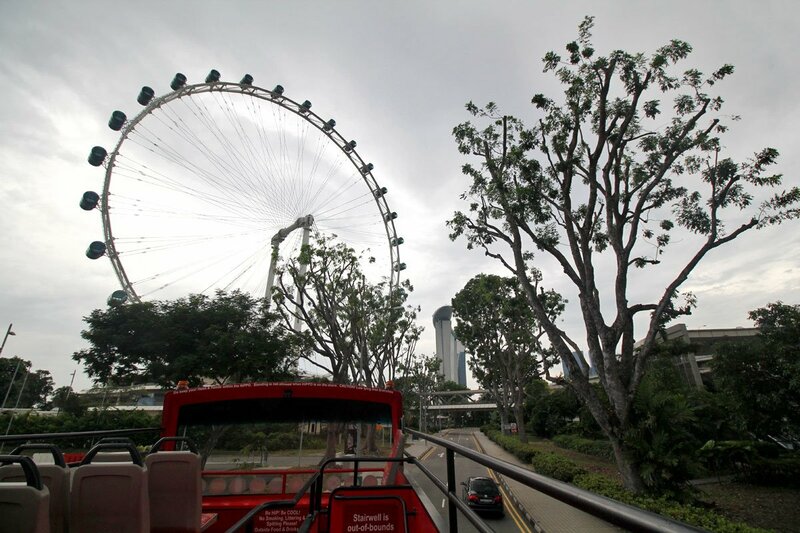 The Singapore Flyer, one of the city’s most iconic attractions. This giant Ferris wheel has an overall height of 165 meters and was once the tallest in the world. One full loop takes around half an hour to complete. 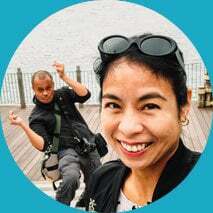 We didn’t ride it but you can check the Singapore Flyer website for more information. I believe DUCK & HiPPO offers combo passes as well, flyers for which you can find on the buses. Right after the Flyer is Marina Bay Sands, another of Singapore’s most popular landmarks. Opening in 2010, it was billed as the world’s most expensive standalone casino valued at SGD 8 billion. To the right of the bus in the picture below is the Helix Bridge which connects Marina Centre with Marina South. Here’s a shot of Marina Bay Sands from Gardens by the Bay. I never thought it looked that interesting in pictures but it’s pretty spectacular in person. Wait till you see how it looks from the inside. Shopping center inside Marina Bay Sands. They have a good food hall here as well called the Rasapura Masters Food Court. The hotel lobby. Isn’t it incredible? 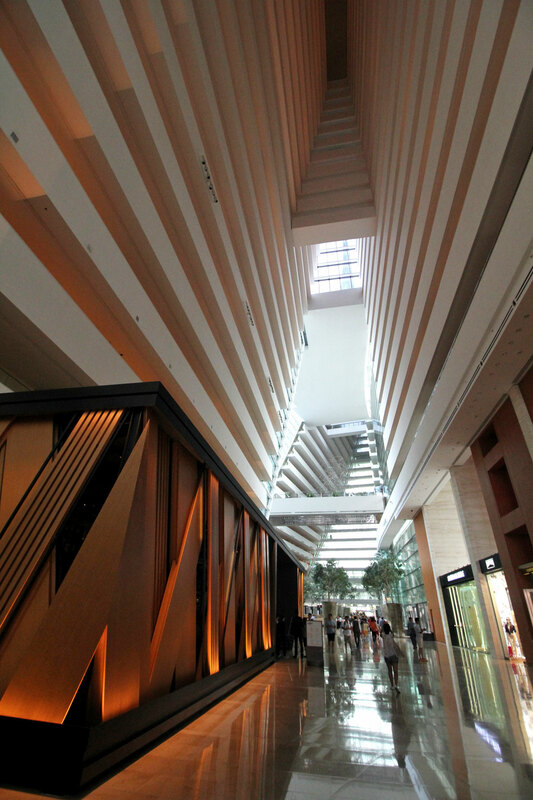 Architecturally, this was probably the most stunning hotel lobby we’ve ever seen. 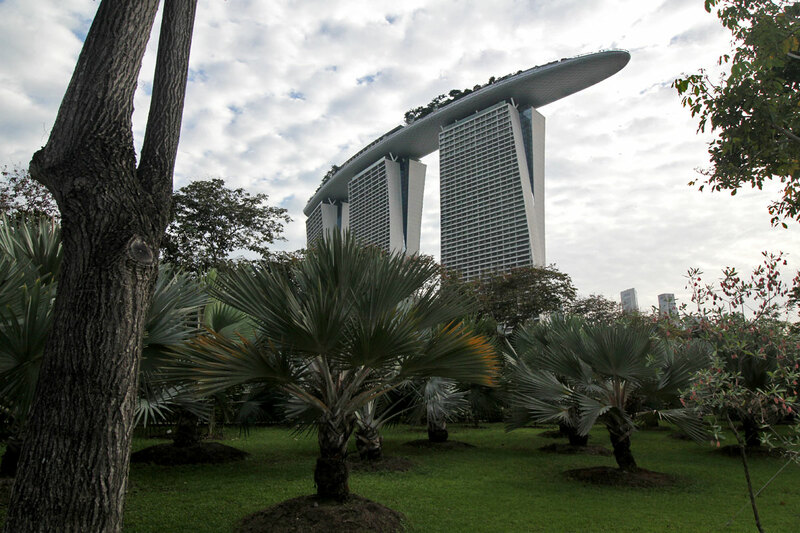 Behind Marina Bay Sands is Gardens by the Bay, Singapore’s top-rated attraction on TripAdvisor. This place will blow your mind. The alien-looking structures below are the famed Supertrees. 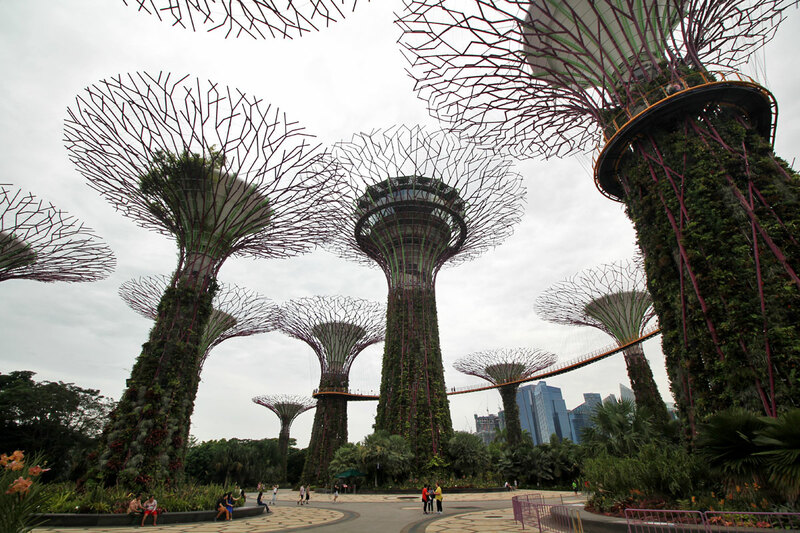 Follow this link for more pictures and information on Supertree Grove. 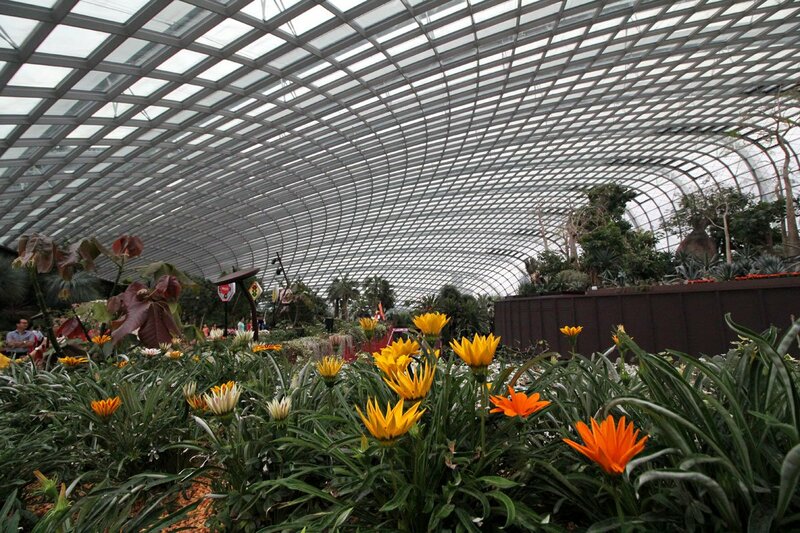 Gardens by the Bay is also home to two incredible conservatories. 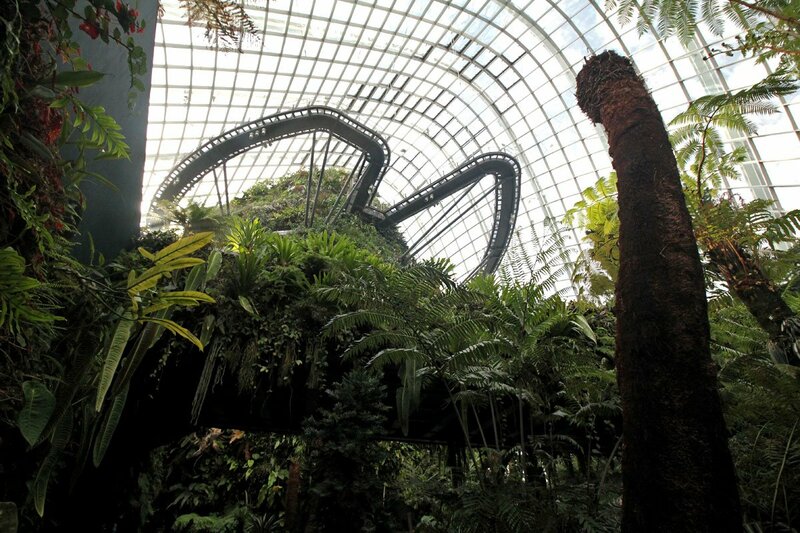 Pictured below is the Cloud Forest conservatory which is arguably the single best attraction in Singapore. Words cannot describe how cool this place is. It’s basically a mountain in a dome that you can explore via an aerial platform. Follow this link for more pictures and information on the Cloud Forest. Next to the Cloud Forest is the equally remarkable Flower Dome which is home to a stunning array of plant life from across the globe. To my amazement, they even have baobab trees here from Madagascar! Follow this link for more pictures and information on the Flower Dome. 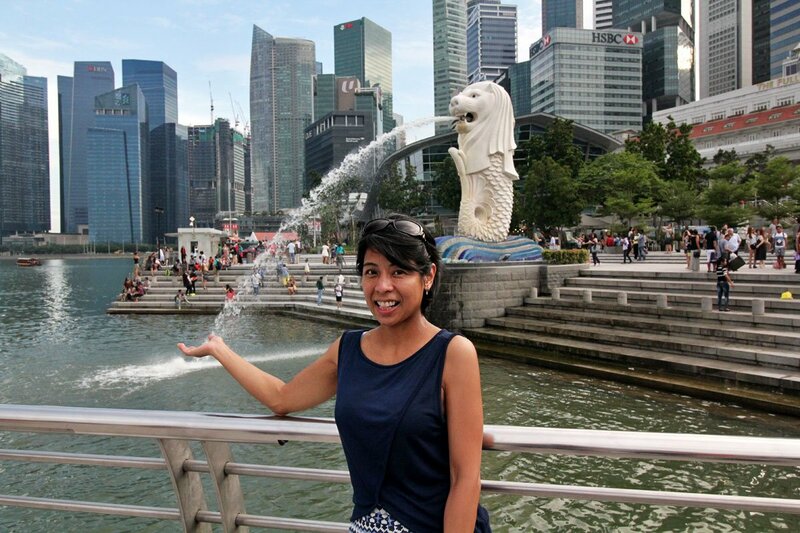 As alluded to up top, you can’t visit Singapore without taking a few token selfies with the Merlion. 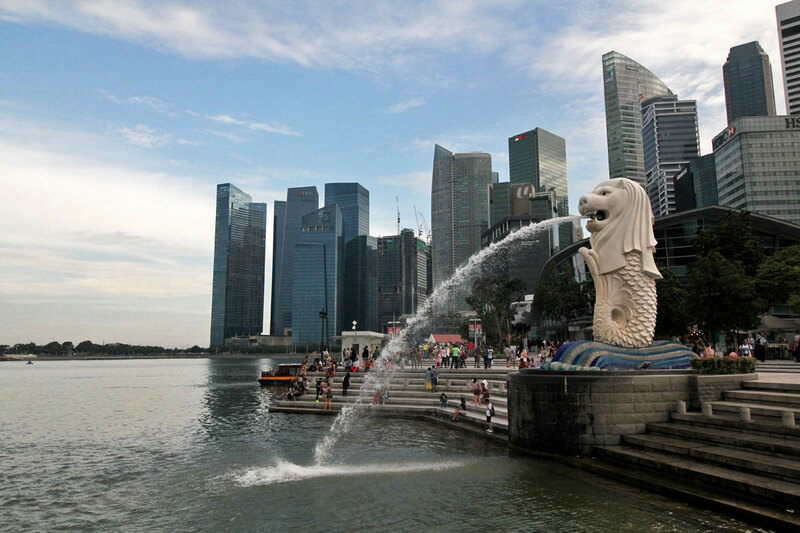 A mythical creature with a lion’s head and a fish’s body, it’s recognized as the national symbol of Singapore. 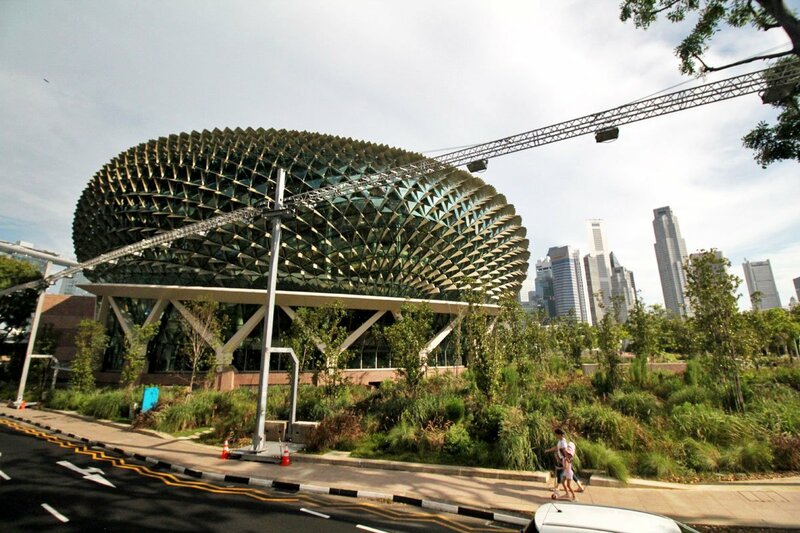 Known as the “durian” because of its uniquely spiny architectural design, the Esplanade is a performing arts center that contains an 1,800-seat concert hall and a 2,000-seat performing arts theater. The architecture in Singapore is pretty badass. You can download the Hippo map for more information on all 7 lines and where they go. Follow this link to download the HiPPO bus timetable. This post focuses on the HiPPO component of DUCK & HiPPO Tours, but they actually offer two types of tours. HiPPO tours refer to land-based Hop on Hop Off buses while DUCK tours involve amphibious vehicles that can traverse both land and water. You’ll embark on a remodeled WWII amphibious Vietnamese war craft that drives into the sea to give you a unique perspective of the city! If you’ve never seen it, it’s basically a boat with wheels. We didn’t do it but you can check the DUCK & HiPPO Tours website for more information. As previously described, there are 7 lines that make up the HiPPO tours. 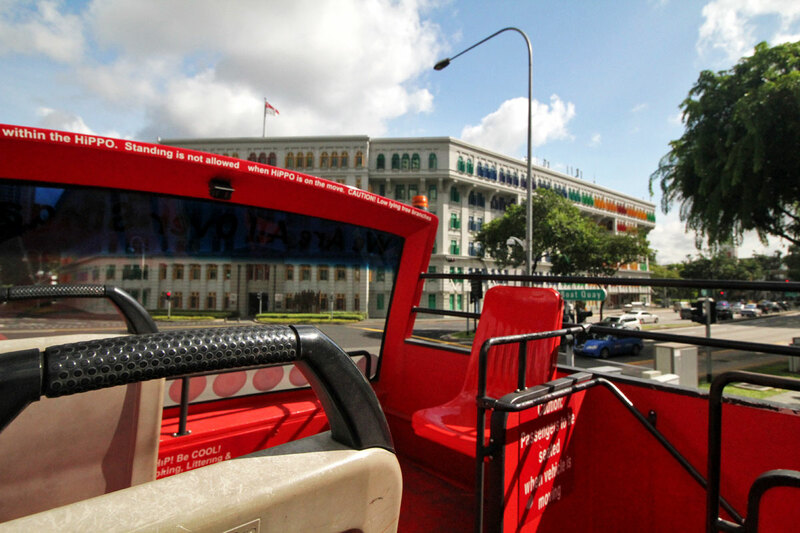 5 take you around downtown Singapore while the other 2 are safari lines that take you to Singapore’s animal parks. 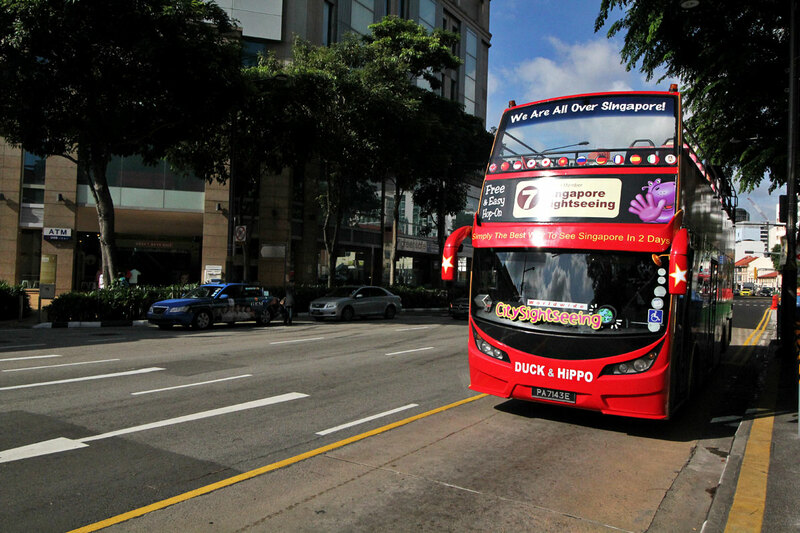 The Singapore 7 Sightseeing Pass gives you unlimited access to all 7 lines and are valid for 24, 48, or 72 hours. Prices for each are as follows (adults/kids): 24 hrs — SGD 43/33, 48 hrs — SGD 49/39, and 72 hrs — SGD 59/49. These can be purchased online or as soon as you get on the bus, which is what we did. Your time starts when you first hop on. So if you bought a 24-hour pass and hopped on at 10AM, then it’ll be good until 9:59AM the following day. If you don’t want to ride all 7 lines, then you can get a City Sightseeing Pass which limits your access to just the Yellow and Red lines. 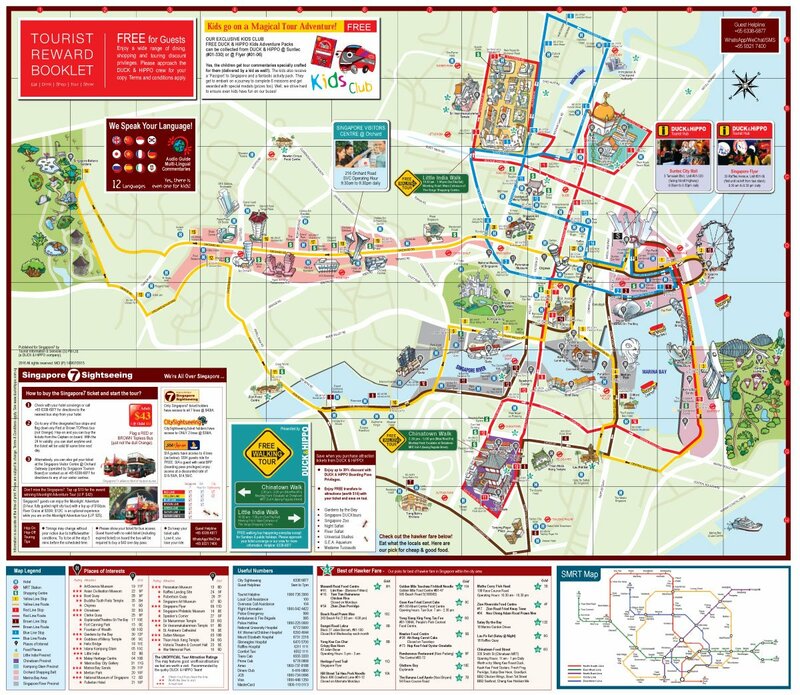 In my opinion, these are the 2 best lines anyway and will cover most of Singapore’s key attractions. These are available as 24 or 48 hour passes. Prices for each are SGD 39/29 and SGD 49/39 respectively. These aren’t available for purchase on the buses so you’ll need to buy them in advance from the DUCK & HiPPO Tours website. Alternatively, you can buy City Sightseeing Passes from Klook. Kkday offers discount passes to Hop On Hop Off tours as well, but to different companies. You may want to check them out too. 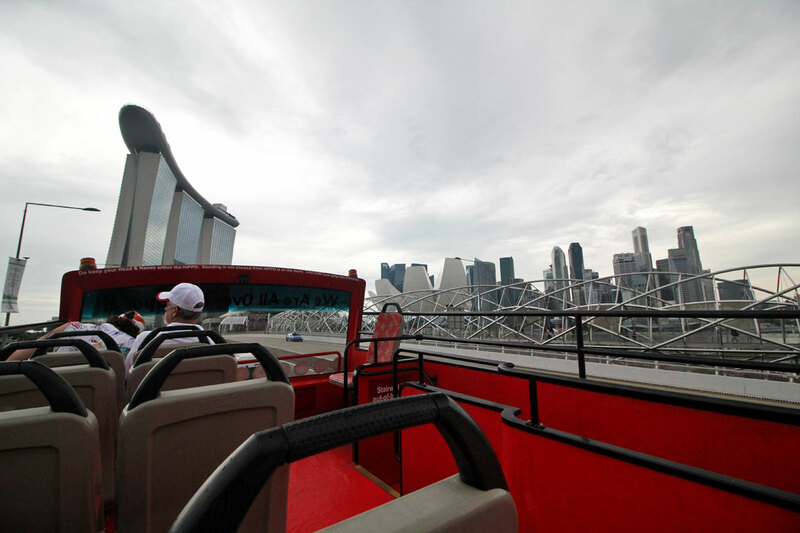 DUCK & HiPPO offers combo passes to some of the attractions along its route like the Singapore Flyer and Gardens by the Bay. They even have combo passes that combine their HiPPO (land) and DUCK (sea) tours. You can check out their website for more information on DUCK & HiPPO packages. You can hop on the buses at any of the designated stops indicated in the HiPPO map above. 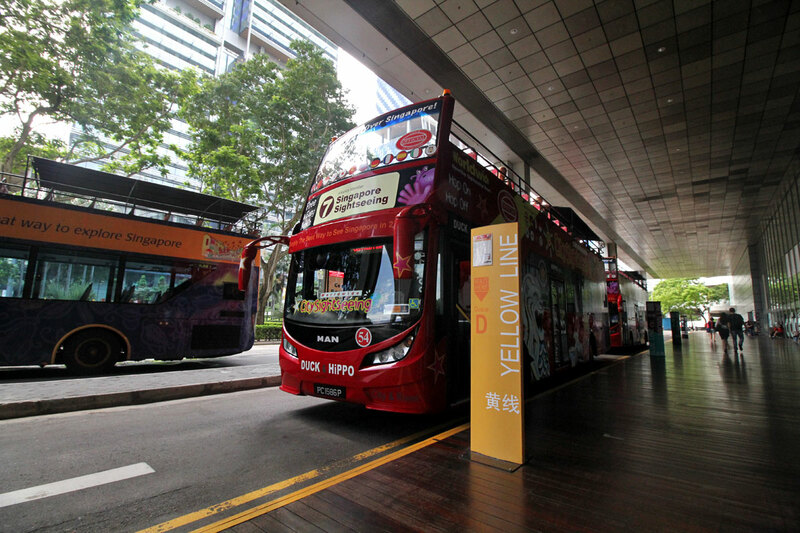 If you’d like to embark from the main station at Suntec City Mall, then you can take the MRT to Esplanade station. Find Exit A to go to the mall and look for the signs to the DUCK & HiPPO terminal.